Florence and I have decided to do reviews of new issues from our pull list as they come out each week. Beware of spoilers, as we’ll be discussing the comics in depth. So far, as you can see, we have a fairly lame and generic title. Let us know if you have any suggestions in the comments. This week it was just two issues, the new Echo and Invincible. Enjoy. Florence: Moore’s art has really developed over the years, especially on men, since I’m more used to him drawing women. I feel like he’s doing a good job creating more than one male face. I really like his style, but he does sort of tend to have one face for all women, even though he does woman’s body shapes in more variety, which I really appreciate. I’m most intrigued by the character of Ivy Raven right now. When we were first introduced to her, she was a very sweet and loving mother, and now she’s clearly very formidable. In one panel we see her anger, and it’s scary. It shows that no matter what level of calm she exhibits, she’s dangerous. The last panel of the comic was very difficult to decipher. Martin: I agree about the last panel being confusing. I won’t describe it for fear of giving it away, but I probably couldn’t if I wanted to, since I have no idea what happened. The old guy on the cover was the only other person at the crash site where Julie got her metal breastplate. Obviously he’s got some of whatever she has stuck to his hand. We only see him for about half a page in the whole comic, which felt weird since he was so prominently featured before we opened the book. I do feel like this was consistent with the rest of the story telling in the series, but the pace seemed to slow down quite a bit here. Not as much happens in this issue, and I guess I was a little disappointed by that. Florence: That’s really just in contrast to the pacing he’s set already with the other issues in this title. That’s not compared to any normal comic’s pacing. This one has just started big and kept going. He’s set us up to expect that from every issue. Martin: That’s true, but I guess I did feel like there were unnecessary scenes in this comic. If it doesn’t turn out that there’s a reason for the missing dog, then her asking about it was only to further highlight the stupid pet monkey that’s chained outside their motel room. The monkey got way more panels than necessary, IMHO. Florence: It’s your turn to go first. Martin: Ha! I’m the one typing, and it looks like you were wrong about that prediction! Seriously, WTF? Invincible has sucked for like 4 or 5 issues now. I don’t even remember the last time it was cool. What ever happened to stuff happening in this comic? Florence: I have detected no deterioration. I think it’s nice that he’s dating Atom Eve. I could have done without the four page spread of their relationship. It seemed to be both past and present. Like a montage. Martin: I was going to say that, damnit. It was totally a montage! Montages are lame in all their forms. Except when used to make fun of montages, like in Team America: World Police. Florence: Really though, if this just disappeared and I got twice as many Walking Dead issues, I’d be fine. Florence: Now that I think about it, I did really like the future stuff, the stuff with Immortal. It seemed like a plausible path for him. Martin: I guess this was sort of like a one-off book. 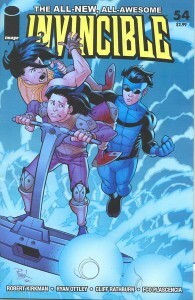 I think Kirkman should have written it as an Invincible spin-off with a different title. Maybe another Invincible Presents Atom Eve… No, that one actually had a cool story, and stuff happened in it. Maybe it should have been called Atom Eve loves Invincible. 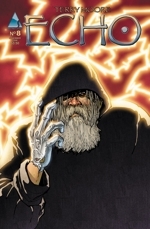 This entry was posted by Martin	on Thursday, October 23rd, 2008 at 11:54 pm and is filed under Image, independent, issues, Married With Comics. You can follow any responses to this entry through the RSS 2.0 feed. You can leave a response, or trackback from your own site. We did think of a good name for this the other night. This, and all future articles like it will henceforth be known as “Married with Comics”.